"Awww, that's what Quinn thought of me?" 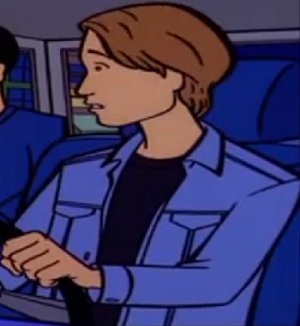 Shawn was part of the double date Quinn arranged with Robert and Daria in "The New Kid", intending to use it to buy off Daria into restoring sports and clubs to the yearbook. Her cover story was that Shawn "never shuts up" and she needed a backup who could talk - in the actual date, an oblivious Shawn could only ever ask "What?" before being told to shut up. Shawn is old enough to drive a car and trusted enough by his parents to have access to one. In "Love is a Way Too Many Splendored Thing", Quinn admitted "Gotta admire a guy who is willing to double date with my sister." This page was last edited on 25 April 2018, at 23:19.